4.5 Mbps while Northern Ireland stumbled along at just 2.3Mbs. 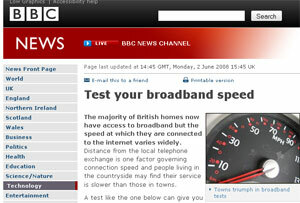 Taffs didn’t fare much better at 2.6Mbps, while Jocks could manage a slightly speedier 2.9 Mbps. Not surprisingly, country yokels suffered more than city slickers, with speeds lagging because of extended telephone line lengths and lack of cable access. 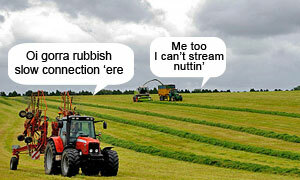 Although BT boasts that 99% of the country can now get broadband, rural customers can still struggle to get the thing downloading fast enough to enjoy services like streaming video. The another obvious reason why the average speed in London is so high is that the infrastructure is on very high level comparing to other regions. The average landline cable lenght required to connect the customer is shorter and it is resulting in better performance to average customer. It is amazing that the average download speed is progressing so fast. I miss the old school modems with 33kbps connectivity. The Londons 4460 kbps stands for 580 KB/sec transfer. This is alowing average user to download a medium sized music file in 6 seconds. All you say is true. Lucky Londoners, eh!